Coach Fernando Gallegos tends to a muscle cramp suffered by one of his players at a recent Friday night training session in Ciudad Juarez. "Breathe! Lift your legs!" Fernando Gallegos shouted at the boys sprinting the 100 yards along the sidelines of a high school's new AstroTurf playing field. Chests heaving with the effort, the 15 teenagers training late on this cold Friday night picked up their pace at Gallegos' command, running as if their very lives depended on it. They just might. "Keep your head up!" Gallegos yelled. A mechanic by trade and athlete by vocation, Gallegos for the past seven years has been the volunteer coach of the Jaguars, an American-style football team at the science-focused magnet public high school CBTIS 128 on Juarez's especially violent south side. He can be found year-round on this field — three nights a week, most Saturdays and Sundays - putting nearly 100 boys and girls through rigorous drills, coaching games, offering football as a lifeline. "Playing American football is not the point," said Gallegos, 46, a bull-like former fullback. "We are trying not to lose these children." "The idea is to keep this field full of kids, to distract them," he said. "We can't do much about the situation this city is in. Our only weapon is to keep them active." Gallegos has redoubled his efforts since the Jaguars lost two players in a January massacre in Villas de Salvacar, a working-class neighborhood. Juan Carlos Medrano and Rodrigo Cadena, whose lives revolved around athletics, arrived in Salvacar just in time for the cutting of a friend's birthday cake. Their executioners stormed in shortly afterward. "Having two boys in the ground - there are no words for it," says Gallegos, his eyes growing moist and gaze distant. "After something like that you question yourself," the coach admits. "What did I fail at? What can I do better? You can come out of this stronger." Many of the Jaguars' players stopped coming to practice in the months after the massacre, Gallegos said. Those who did show up would be sullen some days, hostile on others. But Gallegos, other coaches, former players and some parents kept at it. The number of Jaguar teams was expanded to include older teenagers. More players were recruited. The team was reborn. As part of its effort to improve Juarez, the federal government covered the Jaguars' dirt-and-stone field with artificial turf, shielded it from the flanking boulevard with a brick wall, and installed a few bleachers. About a dozen parents became regular boosters, holding bake sales and fund drives, attending games. The parents of the murdered players are among the most avid participants. "This is what kept him away from trouble," Medrano's 46-year-old mother, Arcelia, said of the Jaguars. "We were always keeping after him, where he was going, who he was going with. "Despite my son not being here, this is my family," she said. "We have to keep supporting them." Among the boys now training for the coming season is Raul Parra, who had driven Medrano, his best friend, to the Salvacar party. After the attack, Parra carried the mortally wounded Medrano to his car, rushing him to a hospital. Only after delivering his friend to doctors did Parra realize that he'd also been shot three times in one leg. Parra has spent the 10 months since the attack training to recover strength in his leg. Now studying engineering at a university, Parra's the starting quarterback of the oldest Jaguar team. "This team is my life," he says. "Like the saying goes," Gallegos said, "If not us, who? If not now, when?" 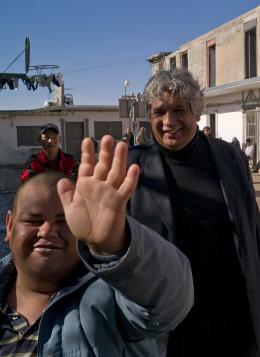 Pastor Jose Antonio Galvan, right, visits the wards of his rehab center in Ciudad Juarez. The 100-bed center cares for addicts and people with mental and physical disabilities. The most desperate castoffs of Ciudad Juarez comprise the flock of evangelical preacher Jose Antonio Galvan. A former construction foreman, U.S. convict and drug addict, Galvan for more than 25 years has been tending to those he says have been chewed up and thrown away. He began his ministry soon after finding religion by setting up soup kitchens for the city’s homeless and drug addicts. For the past 15 years, he’s headed Vision in Action, which provides food, shelter and treatment on the far edge of Juarez for severe addicts and people with disabilities. Though socially conservative, Galvan joins many liberal critics in pinning his city’s ills on capitalism’s shortcomings. He blames maquiladoras, the mostly U.S.-owned factories that anchor Juarez’s legal economy and where many of the city’s single mothers work long shifts for bare survival wages. “This is the generation of free trade, of children abandoned in their homes like animals,” Galvan said of the youths who belong to Juarez’s estimated 500 street gangs and provide gunmen to the narcotics-trafficking cartels. “They see their mothers working like slaves for very little pay. They don’t want that for themselves. The narcos take advantage of that. Vision in Action is one of the more than 80 drug rehabilitation centers in Ciudad Juarez, most of them operated by evangelical groups, that have become frequent targets of warring gangsters. Dozens of addicts have been murdered in the attacks, including five killed early this month. The killers target the clinics because rivals are taking refuge in them, either trying to get straight or sober, or hiding out from their enemies, Galvan said. “They really want to transform themselves,” Galvan said of the addicts. Eight gangsters came for Galvan one day two years ago, he said, demanding $2,000 a month to keep his rehab center open and him alive. He didn’t have the money and spent a long night in prayer. “Lord, you didn’t rescue me to let it end like this,” Galvan said he prayed. The next day he received a call telling him to forget the threats and the payoffs. One of the gang’s leaders, it seems, had once been an intern of Galvan’s shelter and wanted to repay the kindness. “I believe in miracles,” Galvan said. Vision in Action’s shelter, located in the desert about 15 miles outside Ciudad Juarez, houses more than 100 people, most of whom have few other options. Though the state recently paid for kitchen appliances, money is a constant worry. Galvan runs the house, his only help several employees and the part-time services of a psychiatrist. Many of the addicts return to the street or to jobs once they kick their habits. But most of the mentally disabled, many of whom have been abandoned by their families, tend to stay in his care until the end of their days. “There is a powerful judgment of God upon Mexico,” Galvan said. “We have grown apart from our spiritual values. 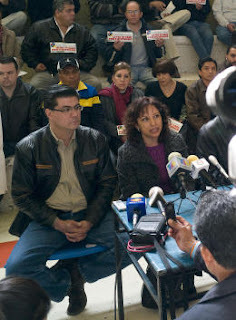 Dr. Leticia Chavarria, a leader of the Juarez physicians' protest movement against the violence suffered by their colleagues, refuses to abandon her city. As a maquiladora staff physician for 15 years, Leticia Chavarria became intimate with the lives of women working the factory floor. Low pay, long hours away from home, losing children to gangs or drugs or both came to define many of those women’s lives, Chavarria said. And that, in turn, changed the nature of her native Juarez. “There’s been a lot of disregard for things,” Chavarria said. “People weren’t seeing the social costs of having a mother outside the house all day long. “This has been developing for years and we are living the con-sequences,” she said. The gangland atrocities that have shaken Juarez often get explained as a war between large criminal organizations, a battle for local illicit markets and the control of smuggling routes to U.S. narcotics consumers. But much of the bloodshed now is between neighborhood youth gangs aligned with one crime syndicate or the other. Many of the victims have been innocent residents targeted for theft, extortion and kidnappings by those gangs. Among the groups hardest hit of late have been Juarez’s medical doctors. At least 20 physicians have been kidnapped for ransom in the city in the past three years. Two prominent doctors were murdered recently by their abductors, even after ransoms were paid. The threat has driven scores, perhaps hundreds, of physicians out of Juarez to neighboring El Paso or elsewhere in Mexico. But it also has spurred others into community activism. And Chavarria has become one of their most vocal leaders. “We are conscious that we are running a risk,” Chavarria said as she prepared last Monday’s citywide strike of medical workers in protest of the violence. “But we also know we can’t stay quiet. Monday’s strike all but shut down most of Juarez’s private and public hospitals for the day. Several dozen doctors and their supporters protested in front of the state prosecutors offices, hanging lab coats stained with blood-red paint from a clothesline. The doctors’ actions failed to spark any wider citizen demonstrations. Protest marches that drew several thousand people in the past are all but forgotten now. But Chavarria remains determined. Giving of oneself against such great adversity..
Galvan makes a very good point with the single women working in maquilas or elsewhere. Many of their kids are the future sicarios; there are a lot of single mothers because the fathers belonged to a cartel or a gang and was a casualty of the narco war. 30,000 killed so far (up to official counts - does not include killings not reported, or killings with bodies destroyed), with 90% being cartel members, most of them males in their late teens or early 20s, that gives us a good 50,000 kids full of hatred against the society and against the guys in the other cartels. These kids are very easy recruits for the cartels and are eager to show how tough they are. El Ponchis is not unique and not abnormal. He is the ugly product of his ugly world. Kids have no future in foocked up Mexican society. No social net there. Terrific job, Don Diego, a heck of a job Calderon. This mess is not going to stop soon. Hola! can we talk about the so called 30K killed?